Non-toxic high chairs are a must, since your baby will eat right off the surface of their high chair (trust me). Here are my favorites! One of my favorite baby milestones is introducing solid foods. It’s exciting to share your love of food with your new baby, and it’s fun to see your baby experience solid food and new flavors all at once! When I became a mom I suddenly became obsessed with feeding my babies, so introducing solids is a special experience for me. And the messy faces are just a cute bonus. 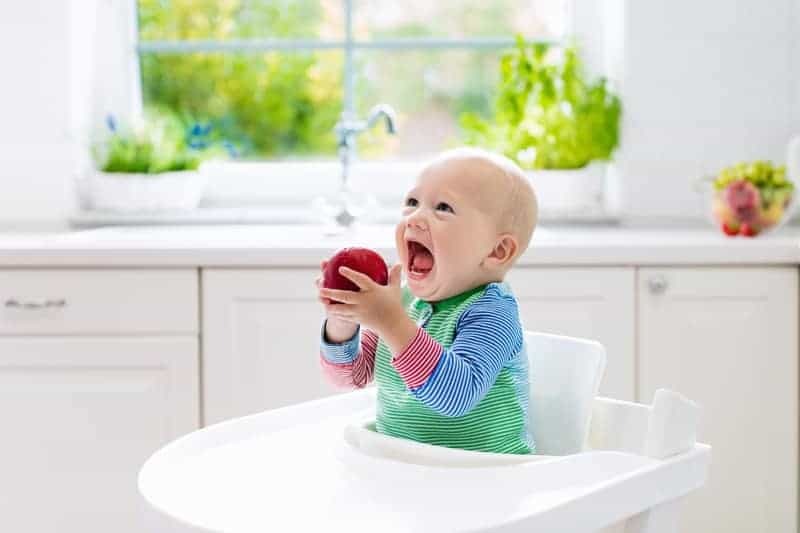 Of course, high chairs and introducing solids go hand in hand (although you can start using your high chair before introducing solids to give your baby a seat at the table). Since meal time with babies can be just a little messy (let’s just say their food will definitely make contact with the surface of their high chair), it’s wise to choose a non-toxic high chair to avoid exposing your baby to BPA, phthalates, and other harmful chemicals. I’ve listed the best non-toxic high chairs (including the best wooden high chairs) below for you to choose from. When Do Babies Need a High Chair? I prefer to wait until a baby is 6 months old to give solid foods. 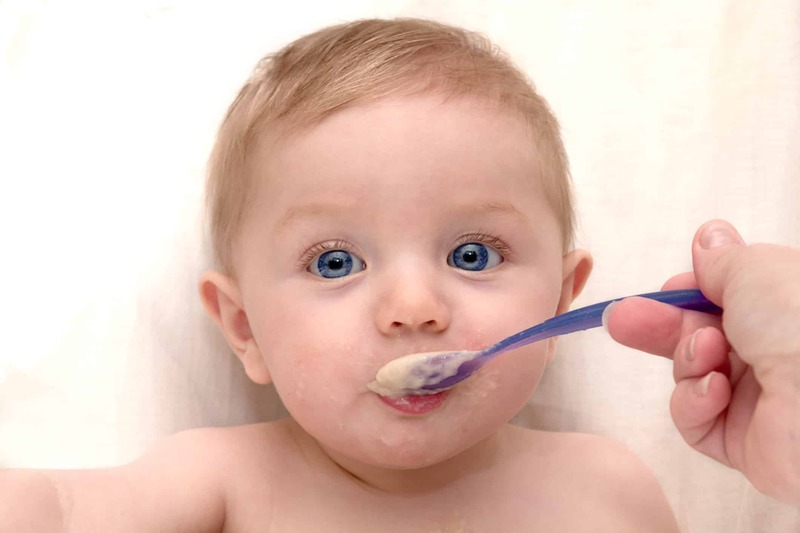 Babies have immature digestive systems, and I see no reason to rush solid foods. I also like to give baby probiotics from birth, though you should run this by your pediatrician first. So, if you’re wondering when to buy a high chair and you’re reading this page, let me say that it’s probably not too early. The first few months with your baby will go by really fast and your baby will be in a high chair before you know it! Made with safe materials. I look for high chairs that don’t contain polyurethane foam, BPA, phthalates, PVC, or VOCs because I don’t want my kids to be exposed to these chemicals during mealtime. All-wood high chairs are a great option, too, though most will come with a food-safe silicone tray cover. Safe and stable. A high chair has to be safe for your baby to sit in. High chairs that don’t have a stable base (like restaurant high chairs, especially) worry me because they are a tipping hazard. (We actually considered buying a restaurant high chair for our home once my son turned 2, but I couldn’t get past my concern of them tipping.) You also want to make sure that the chair has a stable, five-point harness to secure your baby in the seat; the buckle should also be strong enough to be toddler-proof. Comes with an adjustable footrest. For correct seating and positioning, make sure that the high chair you choose has an adjustable footrest. Easy to clean. Some high chairs have fabric seats which can be thrown in the washing machine; while this may sound convenient, I personally find it difficult to keep up with the laundry with a little baby so this isn’t ideal for me. I prefer high chairs that easily wipe clean, meaning that all parts and pieces will stay in my kitchen. Size and footprint. If space is a concern, you’ll want to factor in size when choosing a high chair. Some high chairs can take up a lot of space. 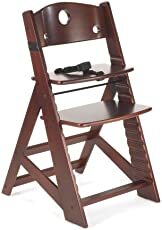 Consider a compact non-toxic high chair or a portable high chair. Grows with your child. Some high chairs are convertible and can be used for years as your child grows. While this is nice, it’s not a huge factor for me because I like to let my kids sit at the table when they are tall enough. But it may be an important factor for you, so keep this in mind as you are selecting a high chair. Taking all of those factors into consideration, here are my favorite non-toxic high chairs. Possibly the most popular among the non-toxic high chairs, the Tripp Trapp is made from solid beechwood and water-based paint. The chair is manufactured in Europe, and the tray is free of BPA and phthalates. It is sold in 14 different colors, meaning you can choose the best look for your home. This chair will grow with your child, but that means that baby accessories are sold a la carte including the tray, baby seating set, and cushion. I recommend using the seat without the cushion to avoid any water resistant treatments, but we did use it for a few months before I realized this. It’s on the pricier side, and there are some less expensive alternatives on this list but you will truly use this seat for at least a couple of years. It is well made and durable. I also like that it doesn’t have the same risk of tipping over as some other high chairs. We are using this with our youngest and I love knowing that it is a safe and non-toxic high chair. I don’t know why I didn’t buy this with my oldest son. In hindsight, I regret thinking that it would be ok to just use any regular high chair. So the second time around, we ended up getting this special edition Tripp Trapp from Nordstrom and I am really happy with it. It is a beautiful high chair that doesn’t stand out like a sore thumb in our kitchen. It fits in very nicely with our decor. The only complaint I have is that I find the straps to be a little difficult to adjust, but otherwise I still enthusiastically recommend the Trip Trapp! The Keekaroo is an adjustable wooden high chair, and is a great lower-priced alternative to the Stokke Tripp Trapp. 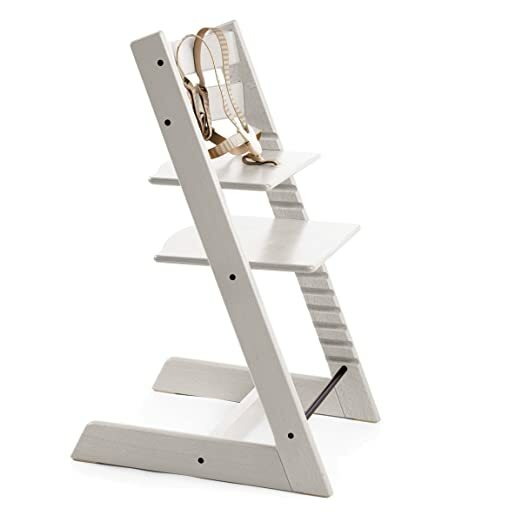 It is finished with a low-VOC plant-based lacquer and comes in three colors, while the Stokke is made with a non-toxic water-based finish in 14 color choices. 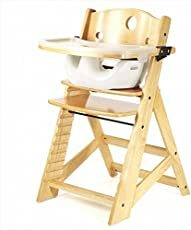 Overall, consider the Keekaroo if you’re looking for an adjustable wooden non-toxic high chair on a slightly lower budget. This chair comes with the option of using a foam cushion but I would prefer to use it without the cushion to avoid foam altogether. Another convertible high chair, the Svan Signet Complete High Chair is made from bentwood and grows with your child from 6 months to young adult. 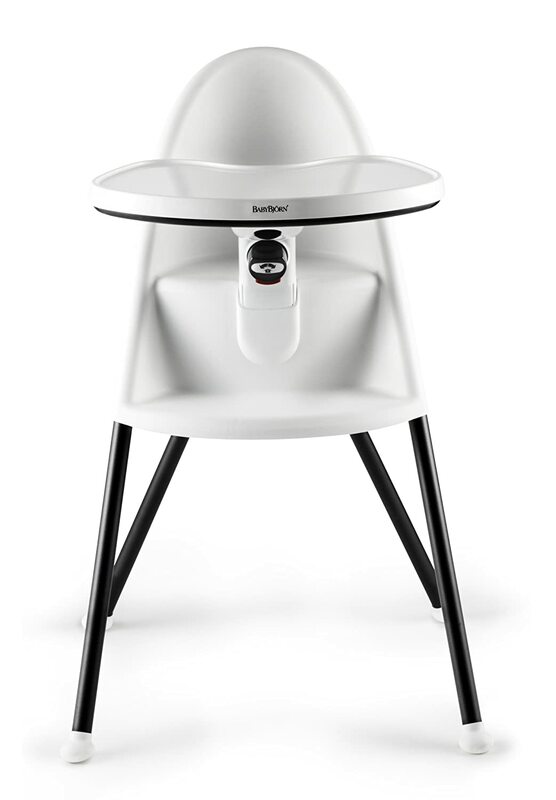 For compact spaces, the BABYBJORN high chair is an absolute winner. 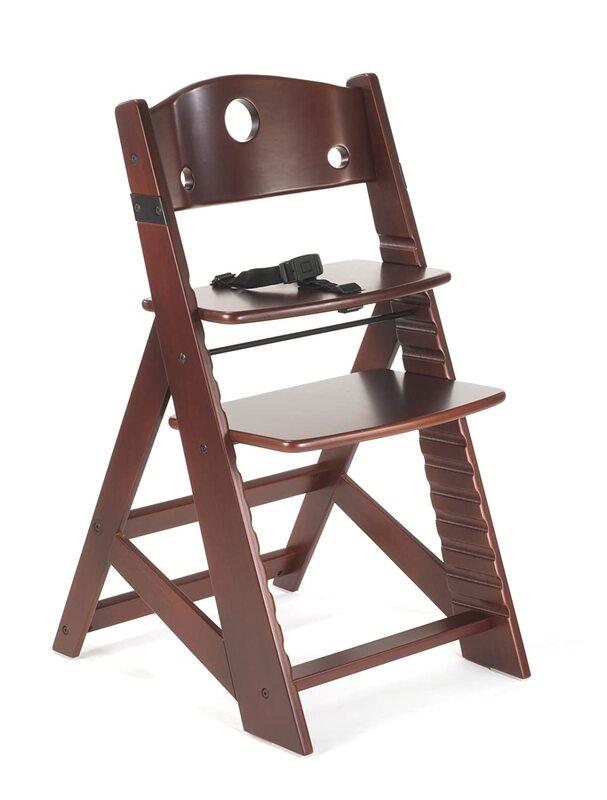 This ergonomic high chair is made from steel and plastic and contains no BPA, phthalates, cadmium, lead, or bromine. Parents love it because it comes pre-assembled, it takes up little room (and folds up), the tray is snug and reaches right up to your baby, and babies seem to love it. It is well-designed and even folds down, making it a great option for use in smaller spaces. Some parents have commented that this chair feels a little snug for their kids who are in the higher percentile for height or weight, so keep that in mind when considering this chair. Which high chair did you choose? We are really loving our Tripp Trapp! Now that my son is a little older he’s enjoying his seat at the big table without the tray. Could you help shed some more light on these products? Personally I stopped using the cushion and don’t feel it’s necessary. I believe their tray is polypropylene and I’ll look at the seat for you and let you know. If it’s polypropylene I’m comfortable using it. Loving your posts! Do you have any suggestions for a non-toxic high hair that declined to accommodate a newborn:under 6 months? 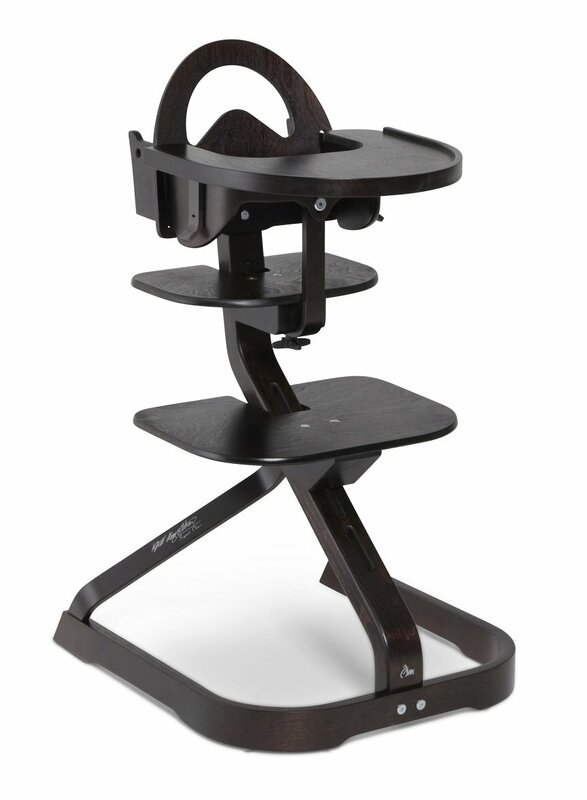 Any insight on the Mima Moon 2G highchair. Oh my typos! I meant to say a non toxic high chair that reclines to accommodate a newborn/baby under 6 Months. What a nice and generous gift! I’m loving my Tripp Trapp as well. It survived a flood – wow! They’re definitely durable. I am looking for a portable non-toxic booster seat, preferably all natural as well. Do you know of any that exist? We try to avoid purchasing plastic items for baby and for our home in general. Thanks for any direction you can give! Hello, thank you so much for your posts! Do you happen to know anything about the Phil & Ted’s Poppy high chair in terms of safety and non-toxic-ness? Hi Jessica! Glad the post is helpful! 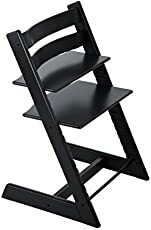 I’m actually ordering a Tripp Trapp today for my little one. I never actually heard back from Phil & Ted’s about their high chairs. Let me follow up and get back to you. Hi Jessica! I got a response from the manufacturer. The Poppy is free of BPA, formaldehyde, and flame retardants. They routinely test for heavy metals and they “comply with all requirements relating to acceptable levels of Phthalates”. The only thing that gives me a little pause is that last statement about phthalates. But otherwise seems like a good option. I’m double checking what kind of plastic the tray is made from. Have you also looked into the BABYBJORN? Yes the Svan is a good option! Been meaning to add it to the site.